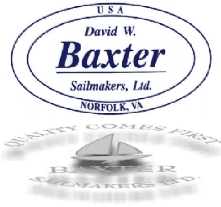 David W. Baxter (British born) I can now say with over 30 years in the business. Over the years we have made custom sails in all types and sizes, for racing and cruising. We offer everything from traditional gaff headed foresails to grand prix tri-radials. Our extensive experience, attention to details, traditional handwork, high-tech tools, such as computer aided design, precision laser cutting unite to produce the finest sails.